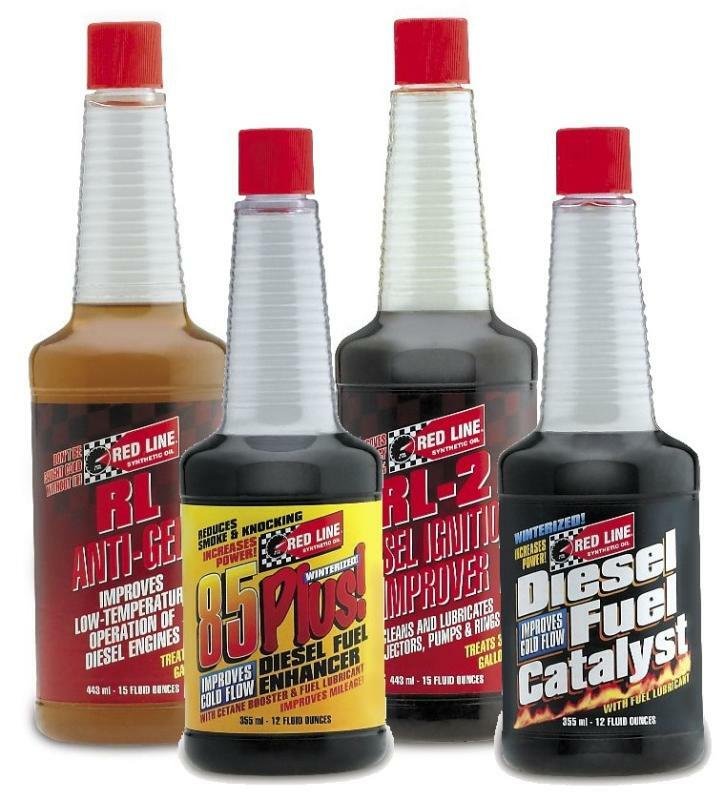 Red Line Diesel Fuel Additives promote better fuel combustion and fuel system lubrication. They provide faster ignition, reduce detonation, reduce smoke, and improve engine efficiency. Extremely powerful high-temperature detergents clean fuel injectors. Lubricants significantly lengthen injector and pump life and reduce ring friction which is very important for today’s low-sulfur fuel. Both Red Line Diesel Fuel Catalyst and 85 Plus are available as a winterized version which will reduce the pour point of a typical fuel by 25°F. Contains powerful high temperature detergents, lubricants and a combustion catalyst. This catalyst reduces smoke dramatically, reduces detonation, and improves fuel economy 4-8% based on fleet and dyno tests. The lubricants can reduce wear in low sulfur fuel by 75%, prolonging injector and fuel pump life. Corrosion inhibitors will help prevent rust and corrosion. Red Line’s most concentrated diesel product for commercial applications, RL-2 Diesel Ignition Improver cleans and lubricates injectors, pumps, and rings while improving efficiency up to 5%. Only 15oz of RL-2 treats up to 300 gallons, making it a convenient for trucking pros and commercial fleet operators to add one bottle at fill up. Fleet customers and agricultural users add one gallon of RL-2 to treat 2600 gallons or add a 5-gallon pail to treat 13,000 gallons. A winterized version is also available. Since fuel companies produce different types of less-efficient diesel in colder regions and seasons, Winterized RL-2 uses pour-point reducers to combat these fuel-ecomomy losses and helps to keep the common wax buildup in suspension. It actually reduces the size and structure of the crystals that form in cold weather (in addition to the product benfits of regular RL-2), allowing for fuel to continue to pass through filters and injectors. One gallon treats up to 850 gallons of diesel fuel, while a 5-gallon pail treats 4250 gallons. Similar to RL-2, this product also contains a Cetane booster. This unique product is important for diesel operation in extremely cold climates, improving low-temperature operation of diesel engines and helping to prevent gelling and freezing. When a diesel engine must be shut off as short as one extremely cold or unseasonable night, a gel than can form on the bottom of a fuel tank (where the fuel pick up is located). If this gel immediately captured at start up, cold start issues and mechanical failure can arise—this product will help to keep the crystalization in suspension to avoid plugging filters on start-up. One 15oz bottle gallon of RL Anti-Gel treats 200 gallons, while one gallon treats up to 850 gallons of diesel fuel.